“There may never be another you,” notes the website of the DNAid art project, “but if there ever should be, would you have any legal rights to the original design?” The answer seems like it should be simple enough: of course we own the rights to our own DNA- it’s a part of ourselves that helps fundamentally define who we are. And even if we didn’t necessarily own the rights to our personal genetic code, it’s not like anyone else could. Experimental artist Larry Miller, however, disagrees. Miller was alarmed by the emergence of genetic patents following the Supreme Court’s 1980 decision in Diamond v. Chakrabartry, which held that living beings and their DNA could be patented under U.S. law; he worried that as genetic technology became more and more prevalent, our rights over the code which makes us us would erode. As a response in 1989, Miller became the first person on record to copyright his own DNA. He was now a Certified Original Human- a man whose genome was no one’s but his own. Miller wasn’t content to stop with just protecting his own genes- several years later he made the “Genetic Copyright Certificate” and encouraged others to assert their ownership over their DNA. He sought to generate dialogue over the expanding role that genetic engineering was playing in a society where GMOs were doing everything from feeding us to curing disease. His genomic rights evangelism expanded as thousands “copyrighted” their genes and word spread via the internet, news media and even, for a time, coffee cups (which is all well and good until Starbucks decides the next logical step in expansion is to do to your DNA what they’ve done to every street corner in NYC). The work of genetic artists like Larry Miller certainly raises questions, but does it offer us any answers? The copyrights he helped create have never been legally tested, but would they hold up if they were? The Register of Copyrights explains that “copyright exists from the moment the work is created,” but does that mean we’ve always owned our genes and Miller was just the first to point that out? Further, supposing that these were enforcible, how would that happen? 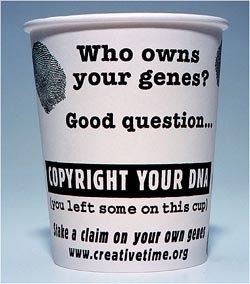 If someone creates a genetic copy of us (or any other derivative work based on our genome), can they claim fair use? Can we send a cease-and-desist letter (and what would it mean for an organism to “cease and desist” using another’s genes)? Can we ask them for royalty checks? These are confusing questions, to be sure, but that’s Miller’s whole idea. He wants to make us ask the awkward and unclear questions about where genetic intellectual property is leading us. He wants us to be confused. He wants us to be concerned. Even the moniker offered by DNAid, “Certified Original Human,” ends up offering more questions than it answers. If our genes are derived from our parents, can any of us be considered “original?” Even if we can, why should we claim copyright over our DNA if we didn’t create it? After all, it’s our genes that make us- not the other way around.